It is said that education is the backbone of the society. The appalling condition of education in both public and private universities had been the talk of the town for the last few weeks. While situations of mass student agitation and expression of anger on the system by causing widespread devastation has now become a common phenomenon in Bangladeshi public universities, the private university students have also started to show signs of impatience with the system. The whole thing started when the students of the Pharmacy department of Stamford University, one of the so-called top 9 universities according to the UGC, started to revolt against the authorities. Their demand was that their Pharmacy department had not been approved by the education ministry or the UGC, yet the university continued to admit students with promises that it will soon be. That promise was never delivered and now when the 3rd year students, having found out that their degrees will be rendered worthless, started to pressurize the authorities. The authorities were deaf to the student's demands as usual. As a result, students turned destructive, breaking glasses and openly showing agitation on the streets. “The authorities are not at all student-centered, unlike the other universities; we don't have any cultural activities, no student clubs. Not even a student advisor to talk to. We have to go to either the Registrar or the Deputies. Many of the management staff behave rudely with students and seek fines whenever possible. Once they even bargained with me for the amount of fine for failing to bring my ID card” says Hassan, a student of Stamford University. This is not the only complaint; students also complaint of breaching contract with them regarding the fees structure. This scene is not uncommon in many other private universities. 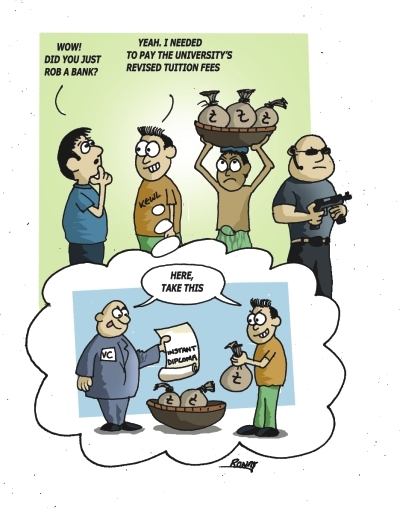 The authorities lure the students with lower fees initially, but within a year the fees start to increase rapidly, the students have no other option but to continue paying. This is especially true for North South University (NSU), the largest and most popular private university. “At first I paid approximately 10,000 per course, but suddenly they increased it to 12,000. Now they are asking me to pay other charges including the charge for the new building called Development Fees which is 3,500 per semester per student.I also have to pay Tk. 1000 as student activity fees” says another perplexed student. Now the new NSU building has been under construction for the last who-knows-how-many-years. One wonders why the students have to pay development charges for a new building which would be owned entirely by the authorities and owners. Also, the construction is taking such long time, students joke that the extra fees are taken so that their children or grandchildren can attend NSU to cover their fees. Students in various private universities also face difficulty regarding academic buildings. UGC rules say that a university should look to locate itself in its own campus within a certain time period after being approved. Only a handful of universities have complied with this rule. Even students of top universities like East West University have gross complaints. “During the rainy season, the university is a mess. The approach roads to buildings where our classes take place are filled with mud and construction debris. There are constructions going on in nearby buildings” said a student, on grounds of anonymity. The same holds true for NSU. The road in front of Sher Plaza is muddy and unsuitable during the monsoon. Even a few days ago, full scale construction was taking place on top of that building. Most private universities share their academic buildings with various business institutions like banks, hospitals and even with fast food shop and other convenience shop. It has become very difficult to identify whether the students are walking into a shop or a university. One of the universities are even taking classes four stories below ground with artificial light and airflow, while full large scale construction of 17 floor is going on top. So far only two storeys have been completed. The location does not yet have full electricity and water supply, and the environment is maintained using generators and artificial air. If for a minute the generator would stop, hundreds of students will be literally buried under darkness, under suffocating conditions. This is the extreme example of students being put to danger for the sake of earning money. According to a faculty of the university, the classes have been arranged “underground” so that some of the running costs and overhead can be covered by the tuition fees of the students studying in this live kobor. Even universities such as the Independent University, Bangladesh (IUB) have been operating for as long as 10 years or more and are yet to shift into proper campuses. Recently, another news that caught the attention of the readers is the feud over the Vice Chancellorship of Darul Ihsan university. Two individuals have been claiming themselves as the authorized VC of the university. As if the comedy wasn't enough, the students were finally forced to lockup the VC's and force them to come to an understanding with the students. In fact, it is an alarming trend in many private universities, to operate without any authorized VC's or to have VC's who lack the academic experience and qualification to hand out certificates to students. Most of the universities are run by VC's who are simply the owners of the institutions. In fact, most of the members of private university associations have directly refused to follow the directive of the UGC and government and are asking to revise the laws regarding appointment of VC. This is an insult to the system of education, and very soon, we will perhaps see rich yet uneducated people becoming VC just by investing crores of takas. Higher education, subject to market conditions. I guess there have been enough rants about the condition of private universities. When it started out, it was a boon for the many students who couldn't get an admission in various public universities due to lack of seats. However, the situation got out of control over the last few years as it has become a highly profitable business and authorities are slack about the conditions of the students. So choosing between public universities and private ones is like trying to decided on the lesser of two evils.